Can you identify this mystery bird? Photo by by Flipkeat via Birdshare. In summer many young-of-the-year songbirds fledge from their nests. In seemingly no time at all, midsummer bird watchers are beset by a rush of bland, brownish birds in juvenal plumage. 2. To which group does this bird belong? One thing to keep in mind with juvenile songbirds—they have adult sized bones when they leave the nest. They may have shorter wings and tails than adults because their feathers are not fully grown, but you can rely on their bill shape and leg length being true to their species. In this photo, sparrows and finches come to mind because of this bird’s streaks and stubby bill. Also, blackbirds have thick-based, sharply pointed bills and are often on the ground. 3. Which species? 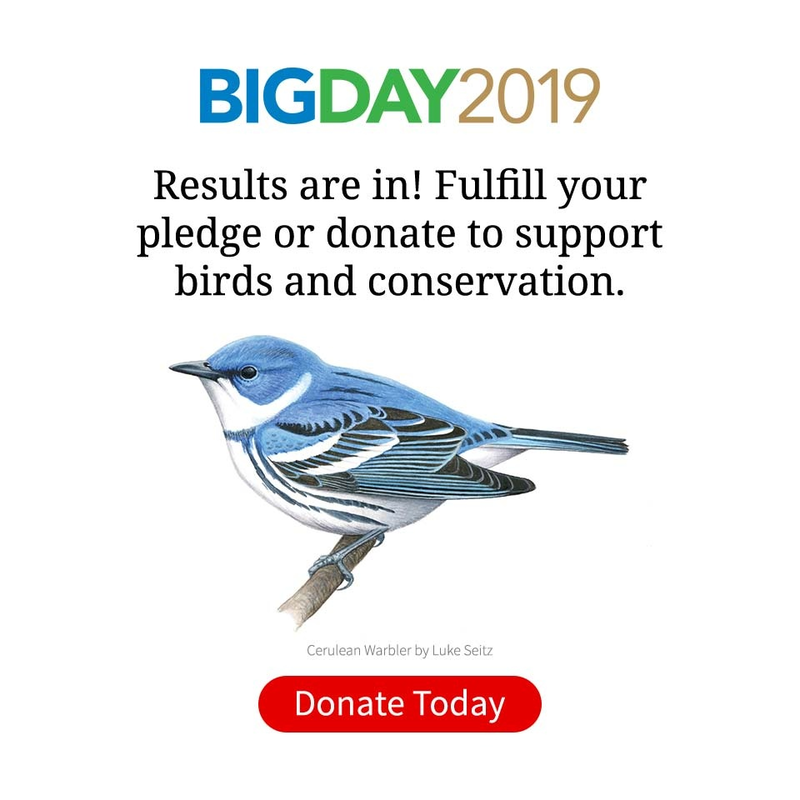 This bird’s hefty bill is too thick for a House or Purple Finch. It’s also longer-proportioned and larger than either of the finches. 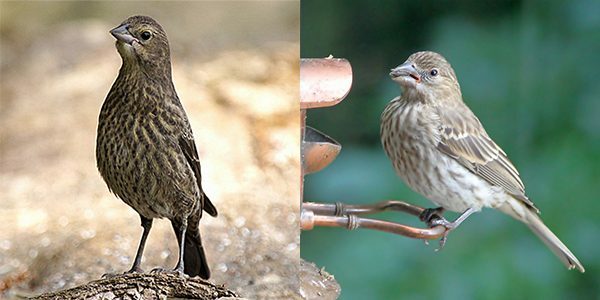 Here’s the mystery bird compared with a House Finch (right) by Mark Moore. 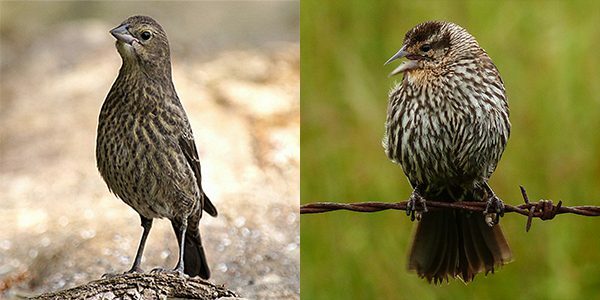 Female and juvenile Red-winged Blackbirds are similar, but they have a longer, pointier bill and more clearly defined, darker streaks on the head. 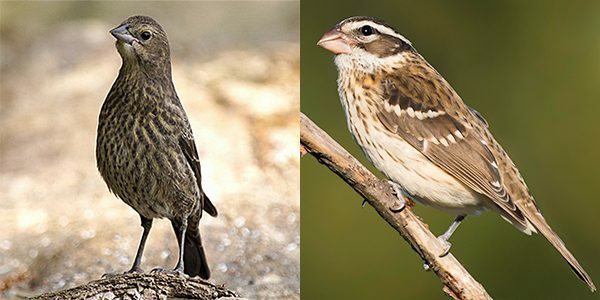 Compare the mystery bird with the higher-contrast streaking of a female Red-winged Blackbird (right) by Anne Elliott. On a Song Sparrow, there is more contrast between the streaks and the overall body color. On the mystery bird we notice streaks, but the entire breast and belly is streaked, uniform in color, and there’s no clear distinction where a streak starts or ends. The mystery bird’s streaked belly means we can cross many sparrows off the list of possibilities—and its hefty bill is even larger than a typical sparrow’s bill. 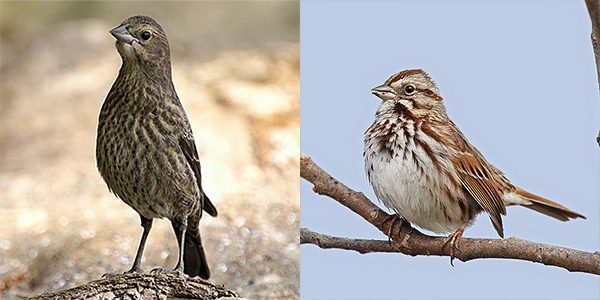 Here, the mystery bird shows far less contrast—and overall different shape—than a Song Sparrow (right) by Ryan Schain. The head is fairly plain overall and the eyebrow blends right in, so we also cross off anything with a bold head pattern, such as juvenile Black-headed and Rose-breasted Grosbeaks. The mystery bird’s large bill is outdone by the Rose-breasted Grosbeak (right, by Kelly Colgan Azar), which also shows a prominent stripe over the eye. What else is brown and streaky with a thick, short bill? As we mentioned, blackbirds are often found on the ground. They tend to have thick but long, sharply pointed bills. 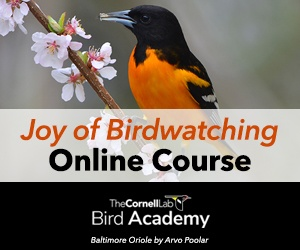 However, Brown-headed Cowbirds—members of the blackbird family—have a distinctive short, thick-based bill. 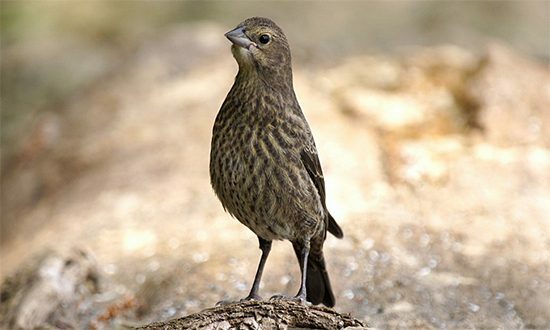 Though the adults are uniformly brown (females) or blackish brown with a brown head (males), juveniles are heavily streaked—and indeed this is a juvenile Brown-headed Cowbird.